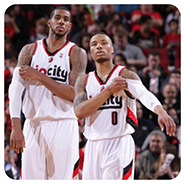 The Portland Trailblazers begin the 2014-15 NBA campaign thinking that they belong with the elite teams in the West. After winning 54 games last year that assured them a spot in the playoffs where they were knocked off in the second round by the NBA champions San Antonio Spurs they realized we could play with anyone. Even after the Blazers had a rough March last year, they still won nine of their last ten games to clinch the West’s fifth seed in the playoffs. Making a strong run at the end of the year and an aggressive showing in the playoffs gave them something to look forward to in their upcoming year. Portland’s ability to remain strong and willing to work together is one reason why last year turned out the way it did. Returning almost the entire roster from last year will be a definite plus this year. 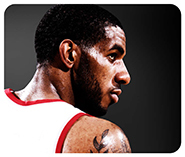 All-stars LaMarcus Aldridge and Damien Lillard will help to lead the charge to a new campaign this year. 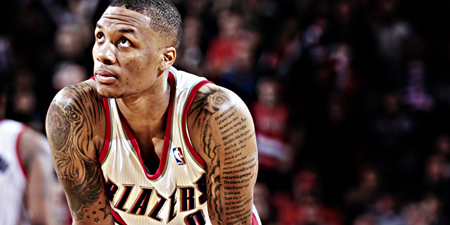 The Trail Blazers used their fourth-year option on Lillard at point guard. 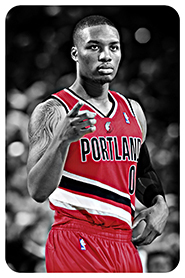 Lillard who made the All-star team after only his second year in the league will bring a 20.7 point average to the court to lead the Blazers. He also averaged 5.6 assists and 3.5 rebounds in his second year campaign. He will be backed up by Steve Blake who is beginning his third year with the Blazers. Blake became a fan favorite during his first two years in Portland. Blake signed a two year deal after splitting the season last year with Lakers and Warriors. He averaged 6.9 points and 5.6 assists last year. The middle looks to be active with the return of Robin Lopez in the 2014-15 campaign. This seven foot center in his sixth year will bring a healthy 11 point average to the court. With almost nine rebounds each game he will be an active center to contend with. Portland also brought in Chris Kaman another seven-footer to back up Lopez. Kaman has been around for 11 years in league with almost 12 points and eight rebounds in the paint for an impressive average. Look for the Blazers to find ways to have both of these seven footers on the court together at times. Last year the Blazers were not expected to make to the playoffs not to mention making it to the second round. To help the make it to the playoffs they won 21 more games last year than they did in the previous year. Look for the locker room leadership and presence Robin Lopez to make an impact with the Blazers giving them the leadership and confidence they will need to be a strong force in the NBA in the 2014-15 season. Even after starting the preseason 0-2 look for the Blazers to have it together October 29th when Blazers will host the Thunder in their regular-season opener.